Maybe your challenges are your Mt. Everest. You know you’re out of energy to take another step. You fear an avalanche of sorrow will drown you in a pool of tears (if you start to cry). Christ used a mountain to encourage His followers. He assured them, “Truly I tell you, if you have faith as small as a mustard seed, you can say to this mountain, ‘Move from here to there,’ and it will move. 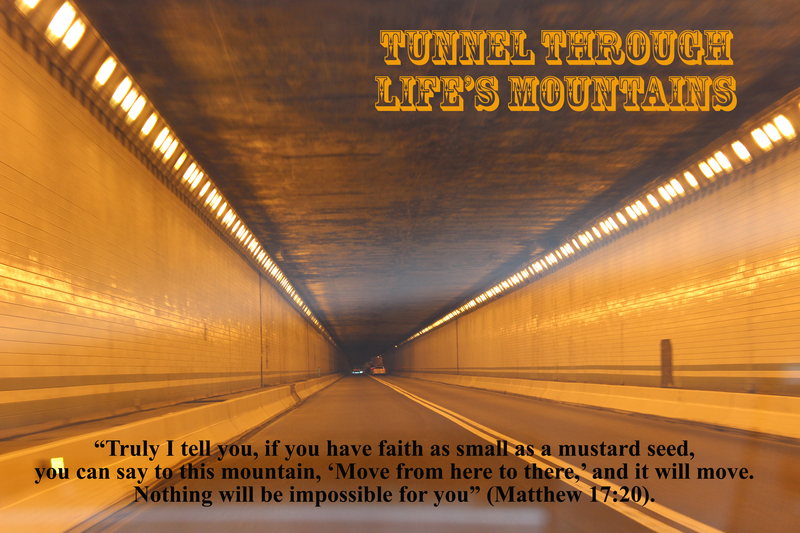 Nothing will be impossible for you” (Matthew 17:20). Yes, we know that we serve the God who can do the impossible. But, how can we remember that His is able when daily struggles tempt us to forget His power and faithfulness? I recently stumbled on a strategy. My pastor was giving a message on 2 Thessalonians. He gave a reference in Ezekiel to reinforce a point. I turned to Ezekiel and noticed I had put a box around the phrase ‘the Sovereign Lord.’ Then, I spotted another box with that phrase. And another. And another. My pastor’s words faded into the background. All I could ‘hear’ was God speaking to me, “I’m sovereign. I’m sovereign. I’m sovereign. I’m sovereign.” Calmness flooded my heart. I turned the page in Ezekiel and found ‘the Sovereign Lord’ in several more places. So, I boxed them. I found myself searching the entire book of Ezekiel. The repetitious act of boxing that precious phrase settled my heart. If you’re world seems chaotic and out of control, uncertain and dark, take time to read his article. You’ll be reminded that God IS in control. So, here’s my tip for the day: head to Ezekiel and do your own hunt for the phrase ‘the Sovereign Lord.’ I pray that the repetition will lead to your reflection of His sovereignty. That truth will relieve anxiety, fear, concern, and worry. As you listen to his song, reflect on God’s sovereign power that can remove all your fears and anxieties. Just a short note to always thank u for this message! As we speak, I am indeed tunneling through a very big rough tortuous steep mountain! Just about went off the cliff last week; lost my bearings and needed God’s GPS to begin to find my way through. I will find out my MRI results soon and pray some health issues will be dealt with. Received a long letter from Keith, a phone call from his wife and a call and text message from the boarder they took in. So, its been a week of anguish, depression, pain and sorrow. So, when I read your article on the Lords sovereignty and hearing my pastors last 3 messages on “the road to Rome”, I began the process on my road to healing. I was at the point where I could not pray for myself and was so very angry at God. I have confessed and repented my anger to my Savior and thank Him that He is a large God and is never surprised at my lack of faith! I have to take responsibility for my words and thoughts. I am going to my church prayer team Tuesday night to be prayed for. They are a powerful group of prayer warriors and though probably none of them have my circumstances, I will not feel judged. I’m glad you reach out to godly saints when your faith is shaky, and when things are so bad you can’t pray for yourself. God not only isn’t surprised by our lack of faith, but He gave us the remedy for such heart-wrenching times: the Holy Spirit who will intercede for us. I’m glad your church prayer team will be praying for you. I’ll continue to pray for Keith and for you (that your MRI results will give your doc direction and lead to a complete and speedy recovery). Sorry my response is so brief. I spent 5 hrs. with Howie in the ER yesterday. He had spent several hours throwing up in the early hours of the morning (Monday morning). After numerous tests, the doctor ruled out two possible causes: heart and gall bladder (both seemed not to be the cause). He was discharged with nausea medication and meds for GERD. He barely ate anything yesterday and didn’t drink much. So, he woke me up at 3:30 AM shivering with a 101.4 temperature. Please pray for him to get re-hydrated and start eating. And for wisdom for his doctors to pinpoint the cause of this episode (29 years ago he had similar symptoms…also during a time of great pressures at work like now…after COUNTLESS tests, he was given a tiny blue pill which seemed to settle his nervous stomach). I have prayed for Howie and you. Have asked Bud to pray, also. So very sorry to hear he is ill and praying the doctors can pinpoint the cause of these symptoms, not just treat them! They do so much pill throwing at us but I pray that little blue pill will appear again and make him well!! Could it be something he ate, food poisoning or some kind of bug? Having these same kind of symptoms so long ago is indeed strange and frustrating! Pray he and you are having a better day today. And Vicki, your response was not brief. Most people would not have gotten back so quickly in view of what you are both going through! You have such a big heart , caring and kind that I am just so blessed to call you my friend. I almost decided not to go tonight to prayer team, but after reading your reply, am going to go. Dog gone it. I just started feeling really ashamed and embarrassed about Keith. I don’t really feel they will judge but then again, I am nervous. I know I will get very deep into my woundedness and brokeness and that creates a lot of tears. But I will go, as you say, thats what others are here for, to intercede with the Holy Spirit , for when we just can’t. Leaving you with hope for all of us for God’s goodness and grace and mercy to fill us up, again and again! When you have a moment and have some energy back, could you please keep me updated as to Howie. I know you both are exhausted. Just take some time for yourself. Praying you get some rest today. Just taking a quick moment to give you an update about Howie. He’s feeling a bit better (ate three meals today). At some point in the future, he’ll see his primary doc for a referral to a specialist (to find out what triggered the episode). He’s been back to work. Yes, I’m exhausted…will take me a while to recover. Thanks for your prayers.